Arnold Schwarzenegger poses for a picture in front of the Taj Mahal in India. Unfortunately he was unable to go inside because he went on a day it was closed. Former California Gov. 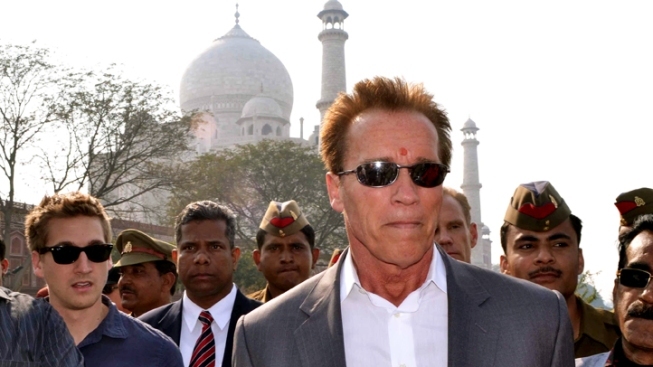 Arnold Schwarzenegger has been enjoying his time off from politics with a trip to India. But the actor-turned-politician has never been shy to steal a headline or two when possible. After being shunned away from the iconic Taj Mahal -- it was closed -- Schwarzenegger took a moment to talk about his return to movies. And it appears the action star has a thing for Bollywood numbers. He told local reporters that he would be interested in appearing in an Indian-made movie if the script was right. "Maybe if there is a good script and a good, interesting director, then -- I mean I worked already all over the world -- I would not mind working in India," he said. "What’s amazing about India is that they have an extraordinary movie industry. They do over 700 movies a year. I mean I don’t think there was ever a year when America did 700 movies. It is really amazing if you think about it." Bollywood has a track record of cheesy stunts and explosions but could the former governor pull off a Bollywood dance?